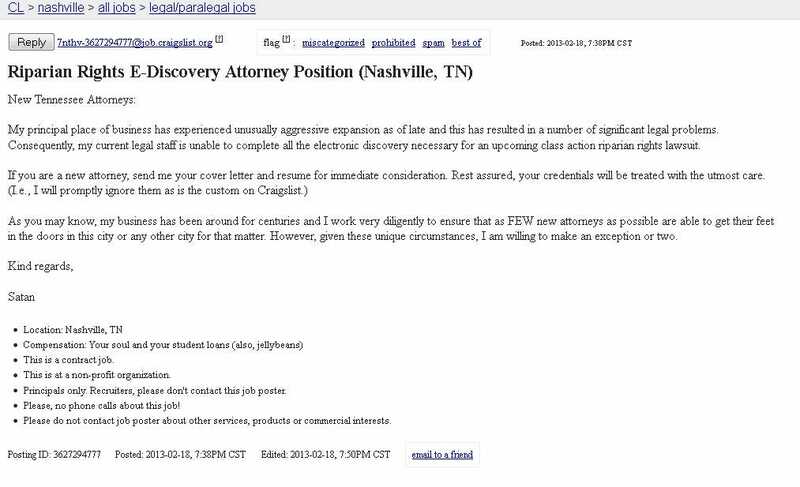 An attorney in Nashville, Tenn. wasn’t shy about the demonic working conditions new hires could expect should they respond to his Craiglist offer. In fact, he was so explicit, his ad actually got removed from Craiglist. 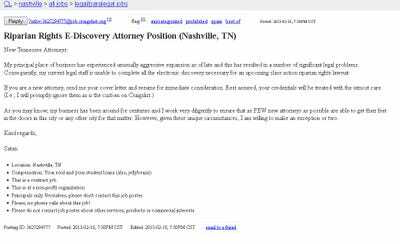 Above The Law posted the entire Satanic job ad Wednesday before it got removed. The ad had been removed when we went to check it out for ourselves early Thursday morning.The legal industry is in pretty rough shape. The industry was completely nuked by the financial crisis of 2008, and there are still way more law school graduates than jobs for lawyers. But hopefully things aren’t so bad that graduates would willingly sell their souls and go work for Satan.